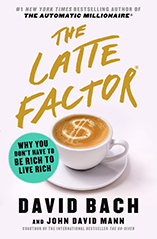 I used to think my Latte Factor was buying get-rich books, but I was shopping at Target the other night and paged through the book The Automatic Millionaire. Seeing some interest-peaking ideas, I purchased the book. It only took me about two and a half hours to read completely. Although some material I had previously read was in there, most of the book was applicable to my own life. Although I can’t give you a dollar figure, I can easily save a couple hundred dollars a month. And although this isn’t a new way to save, I want to pitch it in anyway: I routinely buy two rolls of quarters when I cash my check each week. Then I put them in a jug and let them add up. These are added to all the change I collect from the day. Quickly you can have a small vacation fund or rainy day fund. I not only learned valuable information, but I have jumped started my two sons on their future. They have their own mutual funds started and about $75 a month is automatically taken out of the savings accounts. The most important aspect of the book is auto- auto- automatic. If you do nothing, you end up with nothing. Then you end up complaining how much you are run over by the world. Thanks for a much needed push in the right direction.